Steve McCallion proposes a new declaration that will take the U.S. into the next 100 years. The Declaration of Independence states that all people have the right to pursue life, liberty and happiness–to be free. When it was signed in 1776 the enemy of freedom was clear: heavy-handed English rule that inhibited progress and prosperity. In the nearly 240 years since the Declaration was drafted, America’s pursuit of geopolitical independence has helped it become the most prosperous country the world has ever seen. According to freedom indices that track business, trade, finance, speech and labor freedoms, the U.S. consistently ranks as one of the top nations in the world. But if you asked Americans today if they feel freer that they did just 10 years ago, what would they say? The three parts of the current Declaration of Independence. Click to view a larger version of this image. Like any other great brand that gets distracted by its success, America has lost its way and compromised its future for near-term gains. An opportunity exists to re-ground the American Experience in the core promise of freedom. 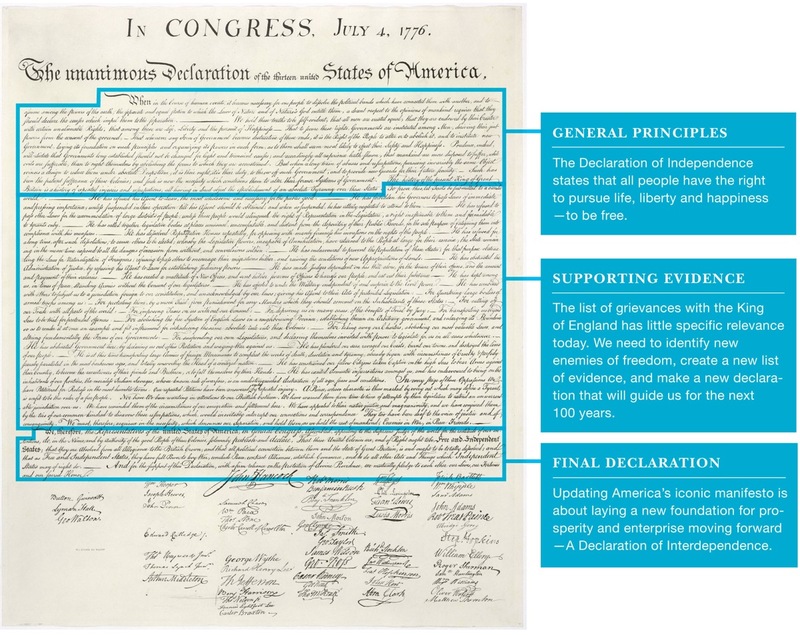 To help reconnect people to Brand America, we turned to our country’s founding document, the Declaration of Independence, for guidance but discovered that it only offers part of the answer. Written in three parts–general principles, supporting evidence and a final declaration–a majority of the document is dedicated to listing grievances with the King of England and has little specific relevance today. To guide us in this new era we need to revisit this great work. We need to identify new enemies of freedom, create a new list of evidence, and make a new declaration that will guide us for the next 100 years. We hold these truths to be self-evident, that all men are created equal, that they are endowed by their Creator with certain unalienable Rights, that among these are Life, Liberty and the pursuit of Happiness. That to secure these rights, Governments are instituted by Men, deriving their just powers from the consent of the governed. That whenever anything becomes destructive of these ends, it is the Right of the People to abolish it, and to institute new solutions that are most likely to effect their Safety and Happiness. That this happiness is no longer defined by geopolitical independence, but interdependence. That personal freedom cannot be maintained without recognizing its unbreakable connection to the collective freedom of our nation, and that of our fellow nations around the world. That in this interdependent world new enemies threaten our freedoms and they are of our own making. In the name of freedom we have grown addicted to oil, debt and personal wealth. And accordingly, all experience indicates that people are more disposed to suffer than to right themselves by abolishing the forms to which they are accustomed. But when a long train of abuses and usurpations limits their freedoms, it is their right, it is their duty to throw off such dependencies and provide new Guards for their future security. – Such has been the patient sufferance of the American people; and such is now the necessity that requires a new declaration. The history of our dependencies are repeated and many, all having established an absolute Tyranny over these States. To prove this, let the facts be submitted to a candid world. We have protected personal freedoms at the expense of the Public good, sacrificing the liberties of all for the economic privilege of a few. We have allowed our obsession with the symbols of success to triumph over common sense, leading to the creation of wealth without value. We have witnessed in complicity a growing gap between rich and poor, in which the average CEO earns 400 times that of his average employee, creating a class of economic royalty that challenges our founding ideals. We have squandered our economic success and technical expertise, leaving us with an ineffectual healthcare system where we spend more per person than any other nation, yet rank 47th in life expectancy. We have allowed education to become a privilege of the wealthy and the few, watching idly as its cost grows at four times the rate of inflation. We have cut funding of community colleges–the last bastion of tertiary learning for many working class Americans–to the detriment of their enrollment capacity. We have shifted the burden of college funding to the next generation, leaving graduates to shoulder intractable debt loads as they enter the work force. We have engaged in the import of fossil fuels on a massive scale, spending over one billion dollars a day on imported oil alone, creating economic dependence, environmental calamity, and an erosion of our national security and personal freedom. We have embraced a high-emissions lifestyle that gives us the planet’s largest carbon footprint, despite possessing less than 5% of its population. We have spurned global actions to alleviate human climate change, alienating our allies and partners and missing opportunity upon opportunity to lead the technical battle for greater efficiency. We have indebted ourselves deeply to foreign economies, heedless of the financial burden it places on our progeny. We, therefore, the Representatives of the united States of America, in General Congress, Assembled, appealing to the Supreme Judge of the world for the rectitude of our intentions, do, in the Name, and by Authority of the good People of these Colonies, solemnly publish and declare, That these united Colonies are, and of Right ought to be Free and INTERDEPENDENT States, and that they be free from the tyranny of ignorance, foreign debt, fossil fuels, illness and human climate change. The Declaration didn’t start the Revolution. It was drafted over a year after the battle had begun. Already in the midst of fighting for our freedom from England, this crucial document helped strengthen our resolve in the face of what must have seemed overwhelming odds. It gave America a collective vision of what we were fighting for and against, and laid the foundation for prosperity and enterprise. Today, we are fighting the new enemies of our freedom, most of our own making, on multiple fronts. Given our slow progress and ineffectual efforts, it’s clear that we lack the collective vision necessary to win these wars. The individual pursuit of freedom has led to a corruption of America’s brand promise and our future prosperity. Updating America’s iconic manifesto is not about restricting freedoms, but ridding us of the dependencies that are preventing true freedom today. It’s about laying a new foundation for prosperity and enterprise moving forward – one that requires collective action and a common vision–A Declaration of Interdependence. The next step is to translate this new declaration into signs, symbols, myths, metaphors and experiences that will make this promise tangible and real. To bring together healthcare, Wall Street and education reform under the common promise of Freedom for All–and awaken a new collective spirit.